"There are those whose life stories would read very much like Louise Nicholas's but who will never have their day in court and whose experiences were not confined to the provinces, or to the 1980s, and the perpetrators were not policemen. There remains a dark side to the experiences of too many New Zealand women and children at the hands of too many New Zealand men." There is truth in this. But it could also be said that there are too many New Zealand men and children suffering at the hands of New Zealand women. Of course that wouldn't play well with the female constituency Key is trying to woo and frankly, too many men just seem to put up broad condemnatory statements like Key's. My own experience is that when it comes to domestic dysfunction the blame can be fairly evenly divided between the genders - acknowledging of course that men usually cause more physical harm. Katherine Rich intimates she is backing Bradford's bill because she is a social liberal. Seems to me there are a truckload of people who would also define themselves as socially liberal who are opposing the legislation. Her statement also begs the question, if there has always been a "small pocket" of social liberals in National why is she the only one backing the bill? As NZ manufacturing takes another hit with F&P closing down one of its Auckland plants it's worth reflecting on not just the role of the high NZ dollar, but the role of government. Ireland is now one of the fastest growing countries in the developed world, posting a 6.0% real GDP growth in 2005 — outstripping its neighbor the U.K., as well as the U.S. and Japan. And where has this dramatic growth come from? Not from within, but from without. Nearly a quarter of the country's GDP is from 1,000 overseas companies who now base their European operations there. This includes nine of the world's 10 largest pharmaceutical companies, and IT giants Intel, eBay, Google, and Microsoft. Over two-thirds of the economy is fuelled by the service sector. The soft-spoken, easygoing charm of its people may attract outsiders, but what lures them more than anything is the pro-business climate, where corporate tax is set at only 12.5% — about a third of the amount levied by the U.S. and other European countries. I could cry when I read this. NZ used to have around six or seven international pharmaceutical companies manufacturing here. But the government drove them out one by one, squeezing prices through their monopoly drugs buyer Pharmac. And what's our corporate tax rate? 33 percent. Today I heard Bill English praising Michael Cullen's plans to drop it to 30. Alisdair Thompson, CE Employers and Manufacturer's Association, who was also being interviewed, snorted. Rightly. We are missing the boat in too many ways and will live to regret it. Have I mentioned it before that my children's most valuable possessions are their UK passports. New Zealand's rate of child abuse isn't good but neither is it far worse than other comparable countries. The rate of notifications needs to be kept in perspective. Australian statistics show; Notifications to child protection systems more than doubled from 107,000 in 1999-2000 to 252,000 in 2004-05, while indigenous children were over-represented in allegations of abuse, children's court orders and out-of-home care. So loose calculations show Australia's rate of notifications is actually higher than ours. Are a majority of Australian politicians clamouring for a law change to criminalise smacking under the guise of reducing child abuse? As far as I can ascertain this is the current legal situation in Australia, state by state; Corporal punishment in the home is regulated at state rather than at federal level, and is lawful throughout Australia under the right of “reasonable chastisement” or similar (Australian Capital Territory Child Welfare Ordinance, 1957, section 124; Northern Territory Criminal Code Act section 27; Queensland Criminal Code Act, 1899, section 280; South Australia Criminal Law Consolidation Act, 1935, section 39 and subsequent amendments; Tasmania Criminal Code Act, 1995, amended 2005, section 50; Western Australia, Criminal Code Act, 1913, section 257; Victoria under common law rule). In New South Wales, under the Crimes Amendment (Child Protection – Physical Maltreatment) Act (2001, in effect 2002), inserting section 61AA into the Crimes Act (1900), physical punishment by a parent or caregiver is considered unreasonable if the force is applied to a child’s head or neck, or the force is applied to any part of the body in such a way as to cause, or threaten to cause, harm to the child which lasts more than a short period, and in such cases the defence of “lawful correction” does not apply. Legal reform is being considered in Tasmania, where in 2003 the Law Reform Institute recommended the abolition of the defence of reasonable correction from criminal and civil law. As at December 2005, no changes in the law had been made. In Australia a new family court process is reportedly producing better results all around. Instead of talking through lawyers in an evidence-based, adversarial system the parents talk directly to the Judge. "There was far more acceptance of the importance of both parents in the child's life and far more respectful communication going on between the parents, and fewer out-of-control moments." While Simon Power has been fussing about the cost of locking prisoners up, especially in police cells, the cost of keeping youth locked up in Youth Justice Residences has gone clean under the radar. It costs $189 per day to keep a prisoner. So how much do you think it would cost to keep a young person? A little more, a little less? For just another $1.81 you could be luxuriating in a Millbrook Villa Suite with a fireplace, patio or balcony with spectacular views over the golf course, mountains or Millbrook grounds, with a mini-bar, satellite TV and video, CD-player, luxurious bathrobes, dial-up or broadband internet access, and full buffet breakfast. It is no wonder authorities are so opposed to detaining more young people. Do you think you have a good standard of living? The authors asked, what is it that causes some low-income economic family units to be in severe hardship while many others have comfortable and good living standards? 57 % of people living on income-tested benefits were living in hardship, of those living on market income 30% experienced hardship, and on Superannuation, only 13%. To cut a very long story short the contributing factors identified are lack of non-income assets, high housing costs relative to income, having children, 17 different types of life-shocks eg relationship break-up, and ill-health of parent or child. The authors then observe, Recognition of the importance of multiple disadvantage can serve as a caution against excessive optimism about the prospect of finding explanations of societal problems such as criminal offending, homelessness, educational failure, etc. in terms of very specific (single factor) causation. Having summarised and diagramised all the factors contributing to living standards a conclusion is drawn that, "there may be an upper limit on how much can be achieved by policies that rely primarily on income measures to ensure minimum levels of material well-being..."
In other words, people's problems cannot be solved by throwing ever more money at them. Eureka! Department of Labour research shows that despite the percentage of migrants relying on benefits dropping, an increasing proportion are going on DPB or sickness benefits. According to welfare commentator, Lindsay Mitchell, "Because the research is confined to those beneficiaries whose residence was approved on or after 1 July 1997 ( thereby excluding other beneficiaries who had immigrated earlier) it has some limitations. In order to make meaningful observations the researchers looked at the uptake in each year from 2001 to 2006 confining it further to those who had been approved for residence in the previous two years." "These figures showed that the number receiving the DPB rose from 2% in 2001 to 10% in 2006. Receipt of the sickness benefit rose from 1% in 2001 to 8% in 2006. Unemployment was steady over the 6 year period." "At the end of June 2006 there were 11,366 recent migrants receiving benefits. 1,591 were on the DPB and 2,160 were on a sickness benefit. 5,569 were on an Emergency Benefit . These numbers exclude beneficiary migrants whose residence was approved before 1 July 1997." "The residence category of recent migrants shows, of those whose residence was approved in the past two years and are currently on benefit, 8 % were approved in the Skills/Business stream, 36 % in the Family Sponsored stream and 56 percent in the International/ Humanitarian stream. According to analysis of data from over 25 wealthy countries, women (counter to what they often claim) do not do more work than men. Interesting. "I thought Milton Friedman was dead"
So said our Revenue Minister, Peter Dunne, in response to an OECD economic report advising NZ to lower tax and sell more SOEs. I take it from this flippant remark Mr Dunne is not an exponent of classical liberalism - at least not now he has a grip of the purse strings. In 2002 he gave a speech in which he said, "Classical liberalism has always recognised the primacy of the individual - not as an isolated unit - but living in and being part of the wider community with all the rights and responsibilities that entails. If you understand that, then you can understand why United Future, with its policies of the primacy of the family, emphasis on individual liberties and community responsibilities, and plain common sense, did so well at the last election." 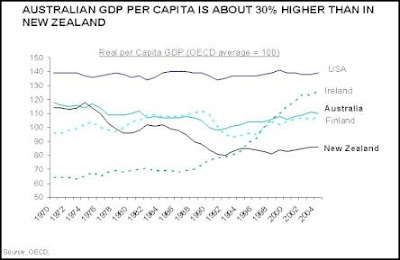 So much for Labour's goal of getting NZ back into the top half of the OECD. We were fifth in 1960, down to nineteenth by 1980 and 23rd in 2004. Look. We have moved up one place in 2005. Despite strong growth performance since the early 1990s and the adoption over the past 20 years of structural policies that are, for the most part, consistent with OECD best practices, living standards have remained some 16% below the OECD median for some years. Labour utilisation has increased substantially, but total economy hourly productivity growth has been lacklustre. Several reasons can be offered that might explain this outcome. First, common to many countries, productivity measurement issues are important. Productivity growth has been stronger in the “measured” sector (where independent measures of both inputs and outputs exist) than in the total economy and has been comparable to that of Australia. Second, the large increase in labour absorption that New Zealand has achieved over the past decade partly in response to relative prices of labour and capital – may have come at the cost of a temporary decline in productivity growth as less productive workers were absorbed into the labour force. Mrs Rich said it did not matter if children missed two weeks from school to hang out in a mall or to go on a skiing holiday, the upshot was the same – it was time away from education. Kids 'hanging out in a mall' are often bored, looking for action (trouble) and their parents may have no idea they are there. Being on a skiing trip the child is occupied, getting exercise and spending what many might describe as 'quality time' with mum and dad. If they have travelled overseas than there is an additional educational factor which might be classified under geography. Schools often run camps revolving around a week skiing or mountain activities. They don't run school camps where kids pitch out at the local mall learning how to eyeball passersby and lift the latest fashion accessories. Surely this is between the school and the parents. It seems to me there is a world of difference between the kind of regular truancy that leads to offending and being out of school in the supervision of parents. National is showing its authoritarian, statist hue again. The household labour force survey shows that the total unemployed aged 15 to 19 actually rose from 23,900 in December 1999 to 26,100 last December. This represented only a slight drop in percentage terms from 15.9 per cent to 14.3 per cent of all those in the age group who were working or seeking work. But.....Benefit figures released last week show that the number of 18- and 19-year-olds on the unemployment benefit plunged from 15,855 in December 1999 to just 1566 last month. From the published data it is impossible to tell how many 15-19 year-olds are on other forms of welfare. The best I can offer is, in December 2006 46,722 18-24 year-olds were on a main benefit. An even distribution across the age-bands would provide 13,349 18-19 year-olds. The number is almost certainly lower than that with the distribution being weighted to higher age bands. Still, that's where some of the unemployed can be accounted for - on benefits other than the dole. Who gives a monkey's for the America's Cup? According to this poll only 34% of us. I couldn't resist having a look because human beings fascinate me. At the moment my attention to Valencia is at about -5% so I had to honestly say, I don't care one way or the other. But I can get very quickly interested in ANY kind of competition. Which is how I think most New Zealanders are. Remember 1994 (I think). Robert was a baby and I had luxury of lighting the fire in the morning and being able to stay home and watch the racing off San Diego. The country was nationally obsessed with it. But now? See how quickly our passion dwindles. How short our emotional memories are. We are made that way for a reason.